After a very busy summer of re-modeling our new house then flying down and spending some quality time with the family helping them with their new home we finally got away with the camper van in mid September to spend some 6 weeks touring around France visiting old and new haunts. We calculated that as we are now living in the South West it would be better to make the crossing from Poole to Cherbourg and save on the mileage by driving up to Dover and then all the way back down to Rennes. In terms of cost I guess it is swings and roundabouts but in wear and tare it does save approximately 1000 miles and two night stops. 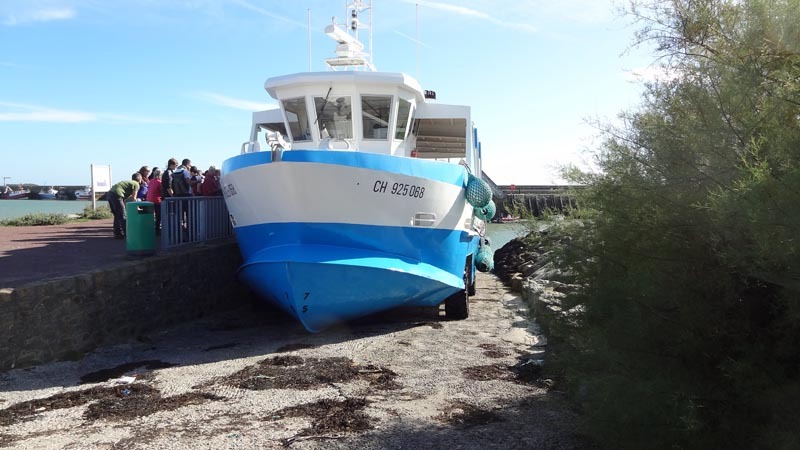 We landed at Cherbourg just before 2pm local time and it didn’t take long before we were on our way South. 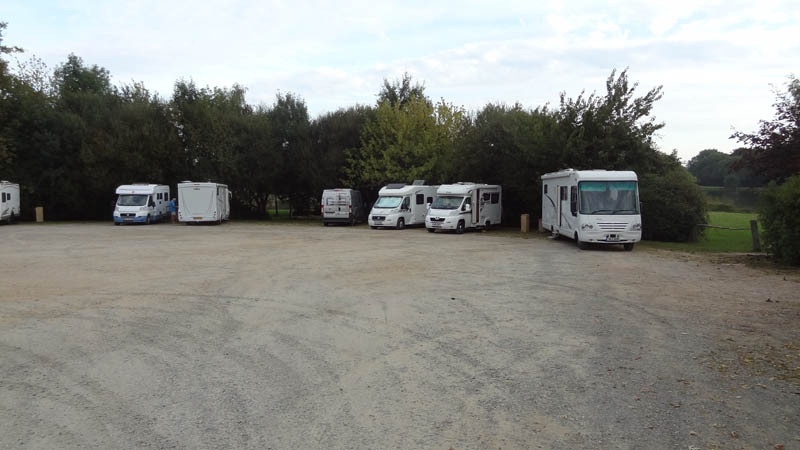 Our first night stop was at the village of Nozay, very conveniently located off the motorway and some 4 to 5 hours drive from Cherbourg Nozay is just a few miles North of Nantes and is situated alongside a lake. We had a short walk into town for a leg stretch but soon headed back to the camper to prepare dinner. Nozay has a good Super U around 1 km away so we filled up with fuel and bought fresh baguette for breakfast. 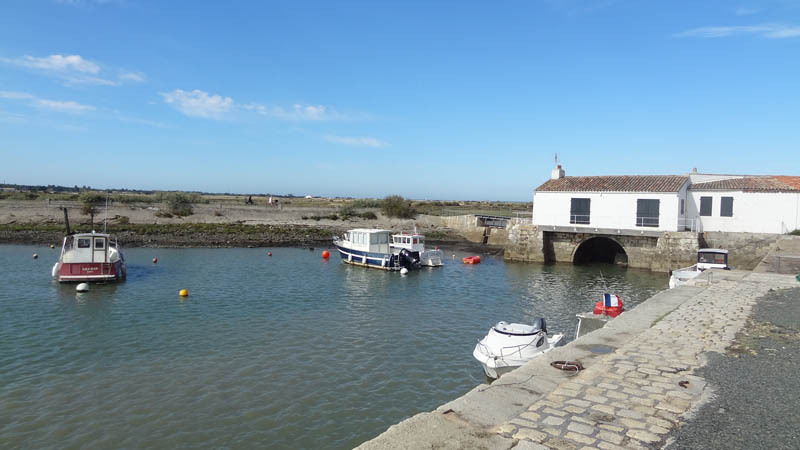 We had decided to revisit Ile de Re as we had enjoyed our previous visit so much. 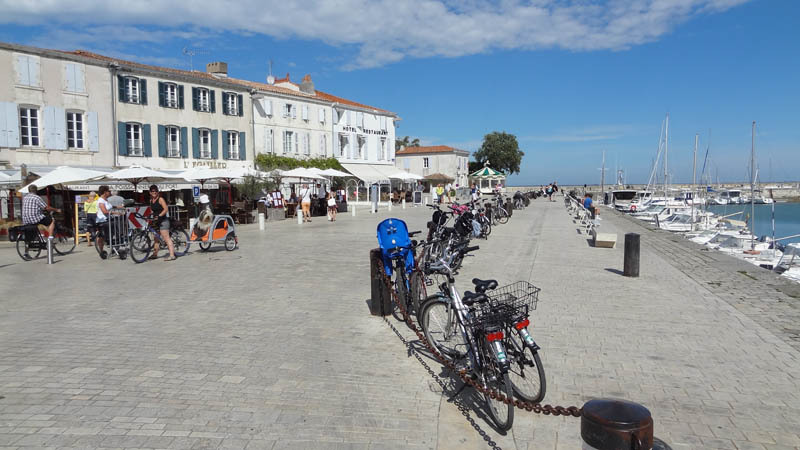 As mentioned before Ile de Re is flat and that is good for old timers pedaling cycles. 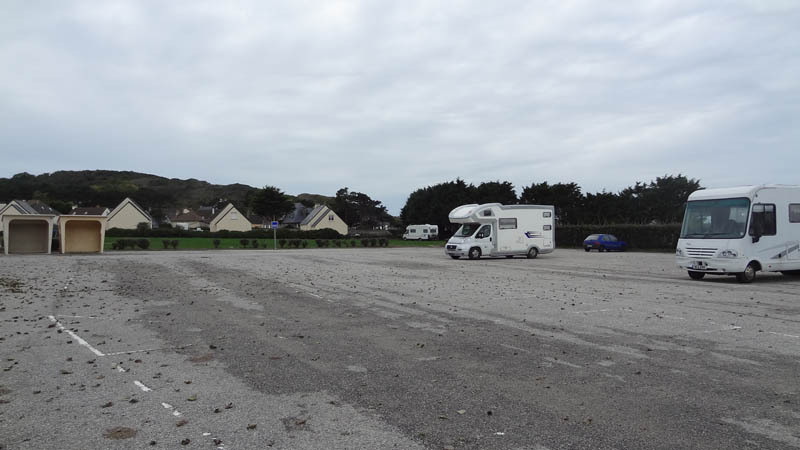 We arrived at St Martins to find the old Aire now has a height barrier to camper vans cannot stop there, however there is another Aire less than 500 mtrs away just outside the camp site and inside the city walls. The following morning we got out the bicycles and cycled along the coast path to the village of Loixand then La Patache before returning to St Martin. My cycle computer showed we had completed 50kms so not bad for a couple of pensioners. We took a picnic and called in one of the cafe’s en-route – well you have to do these things…. During our cycle ride we stumbled on a wild camping place with room for around 20 camper vans. This must be the only free wild camping spot on the island. Speaking to a french couple they said they didn’t like telling anyone about it as if it got too popular the locals would have it closed. 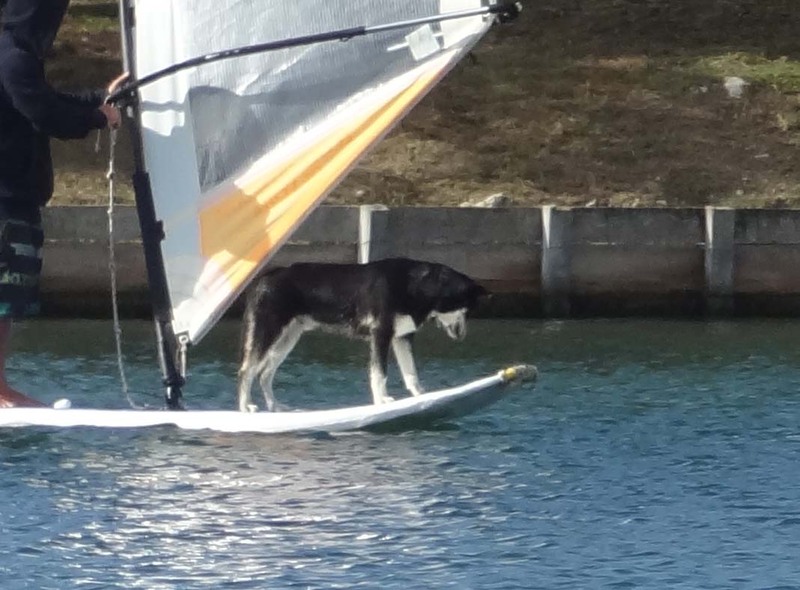 It was near to a wind surfing ans sailing school and spent a few minutes watching the instructors teaching new pupils while a dog stood on the surf board acting like a professional. The following morning we headed off on the bikes in the opposite direction to Rivedoux-Plage and the start of the toll bridge back to the mainland. There we stopped for lunch and sampled the delicious Moules-frites washed down with a beer. We were surprised by the temperatures – around 35 degrees and this is the third week in September. By now all the sites were filling up as there was a festival due that weekend so we decided to head off towards the Dordogne to spend a few days there. We had spent a memorable few days at La Bouges a few years ago so decided to head there as a starting point. Sadly things didn’t work out as within a few minutes we experienced a mighty thunderstorm that went on for several hours. The rain was so heavy that it appeared that we were parked on a lake. All our fellow campers moved on that evening. The Flair is built on the Iveco chassis which is pretty high so we were ok for the night. The following morning even though the water level had subsided we were parked on a field of mud so decided to move on. Our next stop was at Sarlat where the sun was shining and the local community had decided to suspend all charges – a good omen. 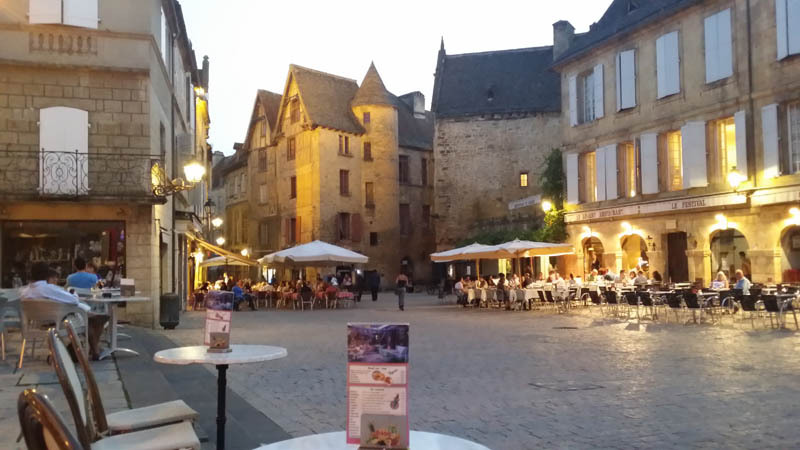 Sarlat is a place that has probably the best night life on the Dordogne however even though we had great weather, sunshine and over 30 degrees during the day there were very few evening traders – but then it was the end of September. Still we enjoyed ourselves and spent a couple of days sight seeing and eating. 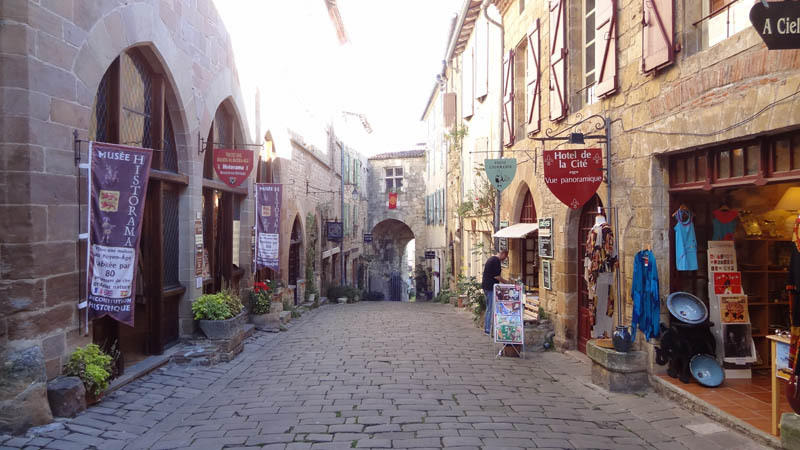 We moved on to a new to us place – Souillac and spent a night and day looking around and cycling along the Dordogne finally moving on to Rocamadour, another favorite of ours. 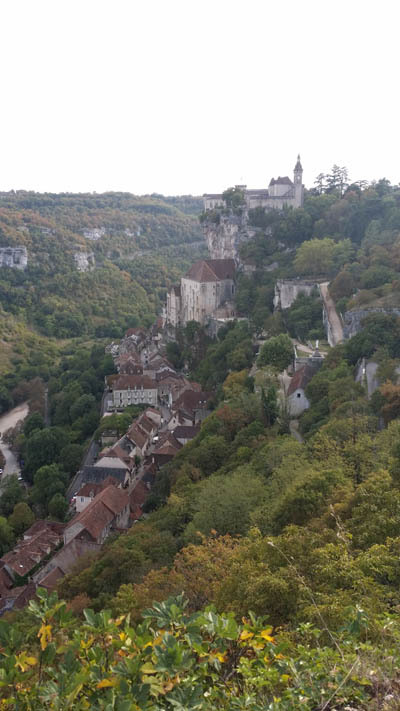 We never tire of Rocamadour and the last weekend in September sees the Annual hot Air Balloon rally. Its great to watch all the hot air balloons rising early in the morning but not good for those who like a lie in of a morning as the noise of the balloons gas burners is quite a wake up call. After a few days at the L’Hospitalet sight we headed off down to Carcassonne to meet up with the family and spent the next three weeks working and playing with the grand children. Throughout the period we had experienced wonderful weather, much better than we had expected with temperatures well into the mid thirties. The only exception had been the thunderstorm at Le Buge. This good spell of weather allowed us to work and play outside during our stay with the family. As always the time simply flew and before we knew it we were heading off north again. This time our first stop was Cordes sur Ceil just to the north west of Albi. Cordes is a pleasant town, situated on a hill and protected by a wall. We were pleased to discover that a short walk from the Aire is the base for the Navette and Le Petite Train that takes visitors to the top of the hill and drops you off at the northern end of the town. This makes it easier for visitors to wander through the town and see all the tourist sites and enjoy looking over the surrounding countryside from the view point situated next to the main hotel and outside cafe. Walking through the town brings you back down through the main town fortress gates and back to the Aire. We did find the town “quiet” at night however it was the middle of October and most of the tourists had gone home. Our next stopover was to return to an old favorite of ours – Userche to the north of Limoges. Fortunately the weather was still good with bright sunny skies and the Aire was well attended as usual (possibly because of the free electric!!!!) however the town itself was very quiet and sadly several shops had closed down giving the whole town a look and feel of neglect. We could only discover one coffee shop open and even that was empty. On a positive note there is a new supermarket opened up at the opposite end of the town to where the others are co-located. We had no specific plans for our next stop as we were travelling along a new to us route from Limoges across to Nantes via Poitiers, Bressuire and on to the new autoroute into Nantes. As we didn’t know what the roads were like or how long it would take us we decided not to head for a specific place as we knew there were numerous places we could stop at anywhere along that route. We wanted to stop at Bressuire for lunch as we had looked at the All the Aires book and found what we thought was a reasonable place to stop. When we arrived the “Aire” it turned out to be a car park with no specific place to park a camper van so we parked alongside (taking up 3 spaces) and had lunch. In the end we made it all the way back to Nozay, arriving there around 3pm. We spent the rest of the afternoon exploring Nozay and picking chestnuts from the abundance of trees all laden with decent sized nuts – much better than paying €6 a kilo. After a leisurely breakfast we set off once more to rediscover Le Mont St Michel – and what a change and transformation – we hardly recognised the area. Gone are all the Aires and camp sites, gone are the old parking areas and the road into the Mont. All replaced by a series of new attractions, hotels and parking facilities. There is even a new Aire – very nice. We thought it a tad expensive compared to the previous places however when you take into account that at €12.50 per night it included EHU, toilets and full services its not a bad deal. There is a cycle track off to the rear that takes you into the “reception area” to catch the free navette that runs 24 hours a day to the Mont. You can still walk of course but you can no longer take the car or even cycle. There are 3 – yes 3 cycle parks. They have almost completed a new bridge across to the Mont and over the past 4 or 5 years have carried out millions of Euros worth of work restoring the town walls, buildings etc. In the new reception area there are hotels, supermarkets and semi-permanent market stalls all selling what appeared to be the same trinkets. If you have never been there its well worth a visit. From Le Mont we headed north along the west coast of the Cherbourg peninsular and intended to spend a few days exploring around. Our first stop was at a small village called Surtaine however in late October this is not a place to stay as everything was closed and there was nowhere to get even a cup od coffee so we moved a few miles up the coast to Souville-Hague and spent a lovely day walking on the beach. The Aire there is highly recommended – there is even a take-away some 50 mtrs from the Aire and its open all year round. 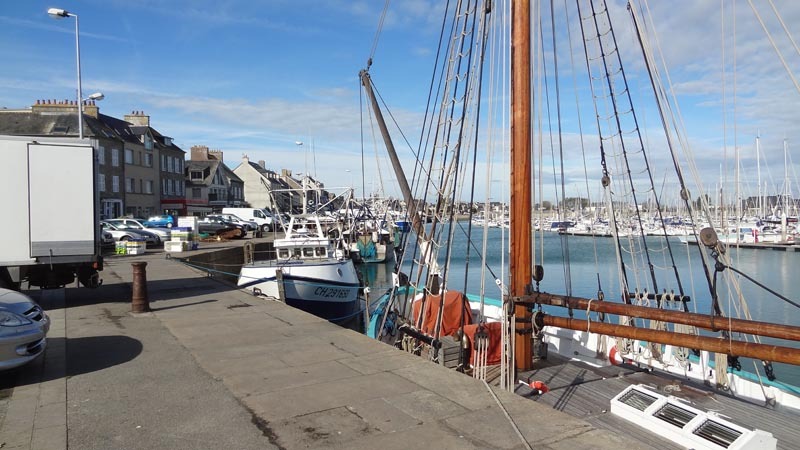 We next moved across to the opposite side of the peninsular to St Vaast-la-Hougue and spent a couple of days there exploring the area. The town is one of the best towns on that coastline. There are a number of harbourside restaurants serving fabulous sea food. There is even a amphibious ferry that crosses to the bird sanctuary island some mile or so off shore. After a very pleasant day we moved over to Balfleur to spend our penultimate night before moving on to Cherbourg. Balfleur is very much a fishing town and has all the necessities of a tourist place. Well worth a visit. Once we got to Cherbourg we stayed in the carpark of the Seaworld museum overlooking the harbour. You are welcome to stay for up to 24 hours on condition that you visit the museum. We arrived too late but had a good look around and it seems to be a good place to visit. Alas our trip was almost over and all that remained was to board the ferry for Poole and a shortish trip back home.